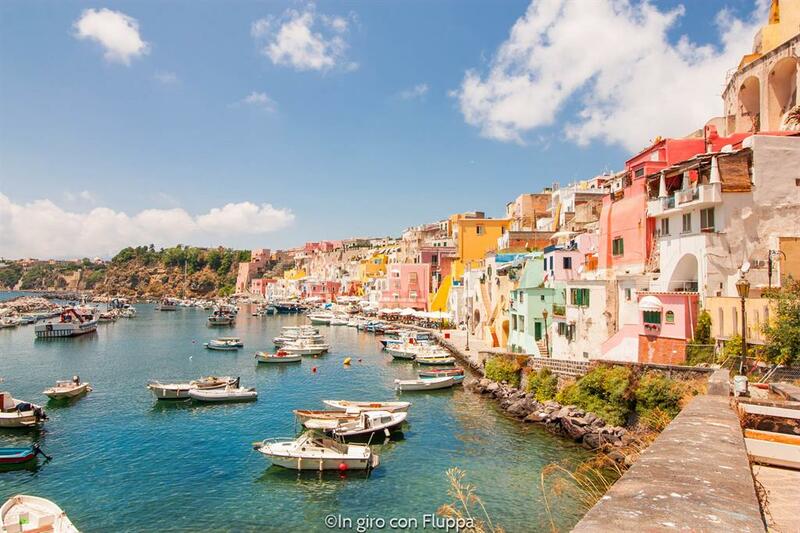 Procida is the smallest of the three islands in the Gulf of Naples. 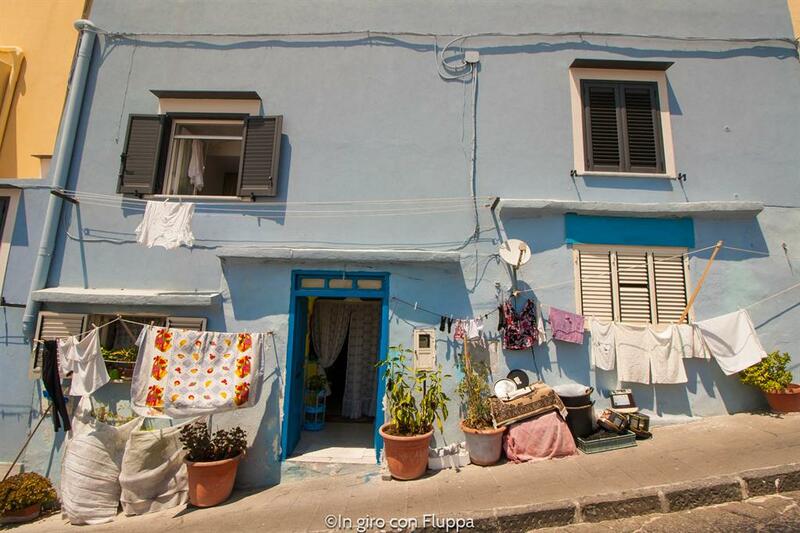 It's very different from its older sisters: unlike Capri, for example, it's not willing to open up to tourism, it's proud of its peeling walls, it's tiny and authentic. 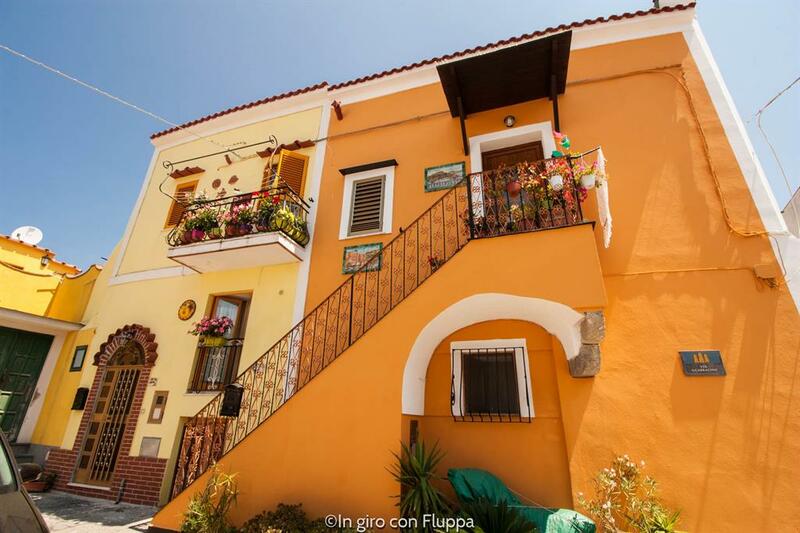 Its 4 km² are dominated by an intense scent of jasmine and oleander, and the dark color of the beaches, recalling its volcanic origin, tackle the intense colors of the houses reflecting into the Tyrrhenian sea. 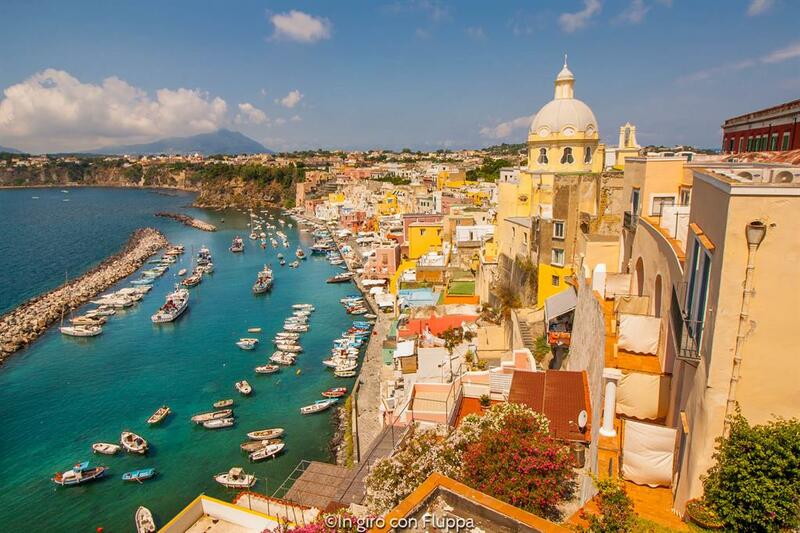 Where is it and how do I get to Procida? 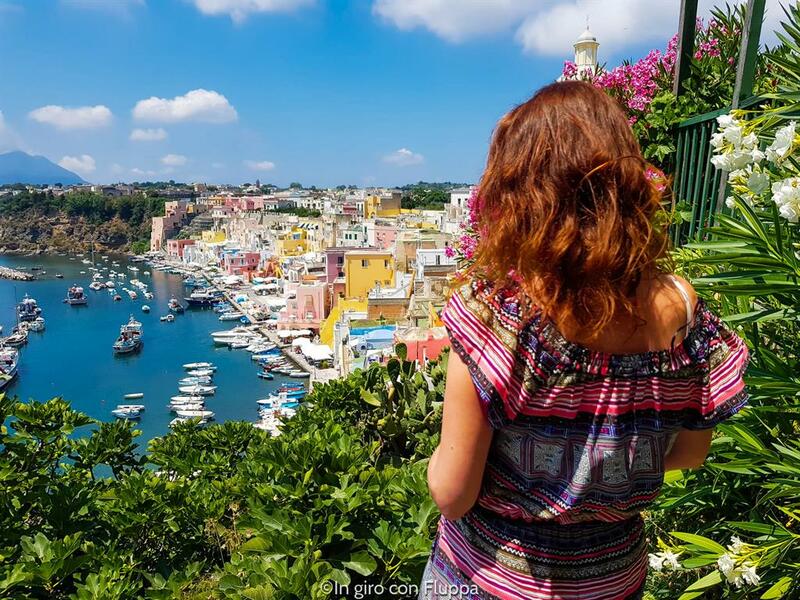 Procida is located in the Gulf of Naples, not far from the city: on clear days, overlooking the sea, you can see it from the coast, especially if you are in Pozzuoli or even better in Monte di Procida. 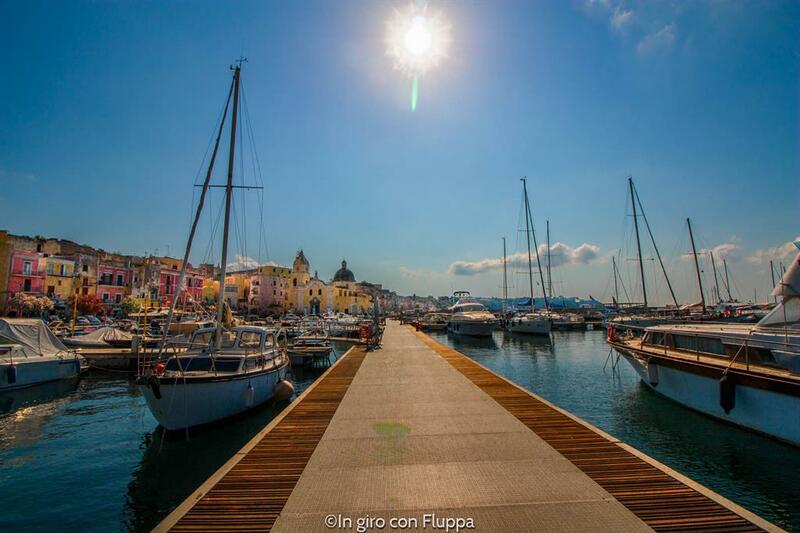 if you are in Naples, you can take the hydrofoil ferry at Molo Beverello harbour, it takes 30-40 minutes but it's a bit more more expensive, or the ferry at Calata di Porta Massa harbour, it takes about an hour but it's cheaper. 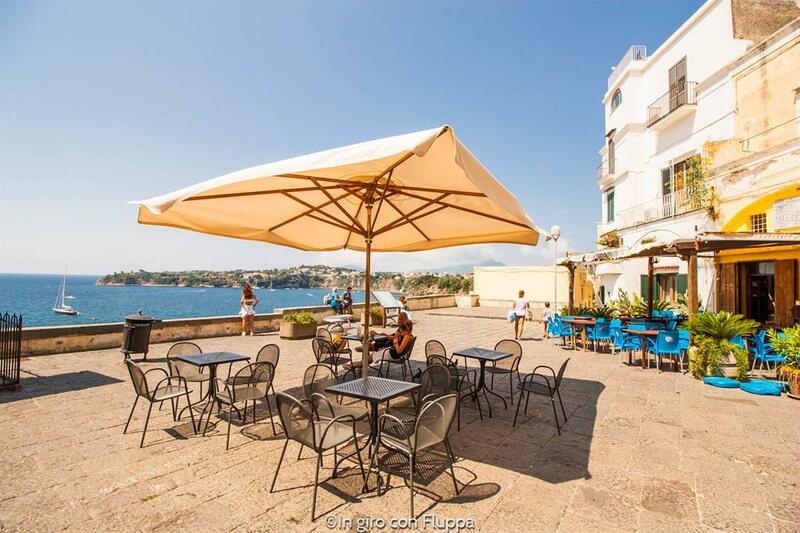 We chose to take the 9.25 am ferry and 6.00 pm return, buying the ticket online at Traghettilines.it: we paid about 30€ each. You can also buy the tickets straight to ticket office on the same day, the price is just the same. 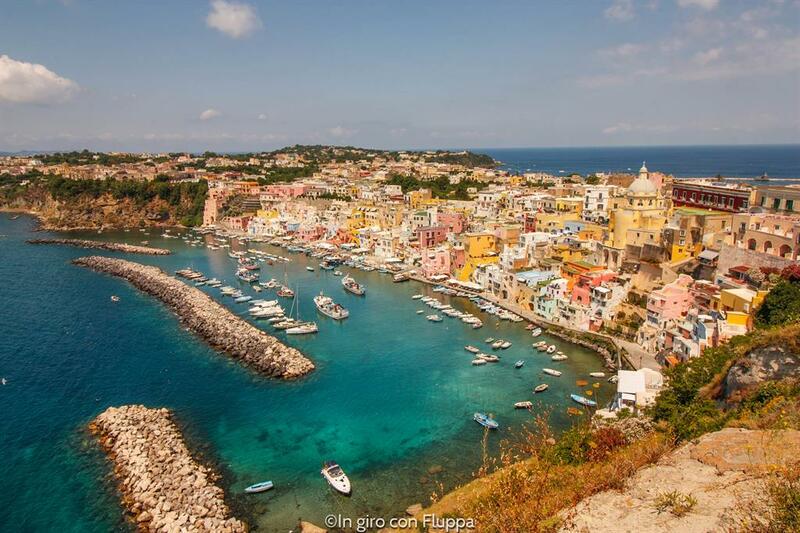 Best time to visit Procida? 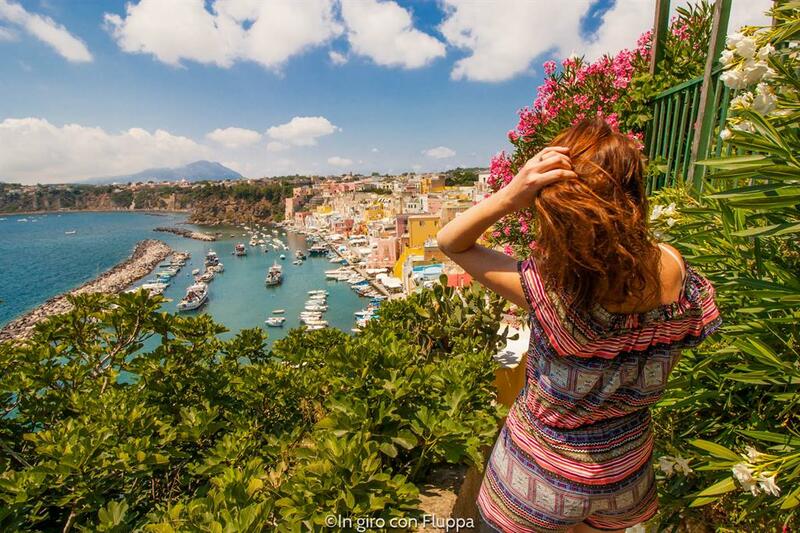 The best months are May and September, when the days are beautiful but it's not too hot. We visited in July and it was terribly hot, but luckily there was a little fresh breeze so we could breathe! 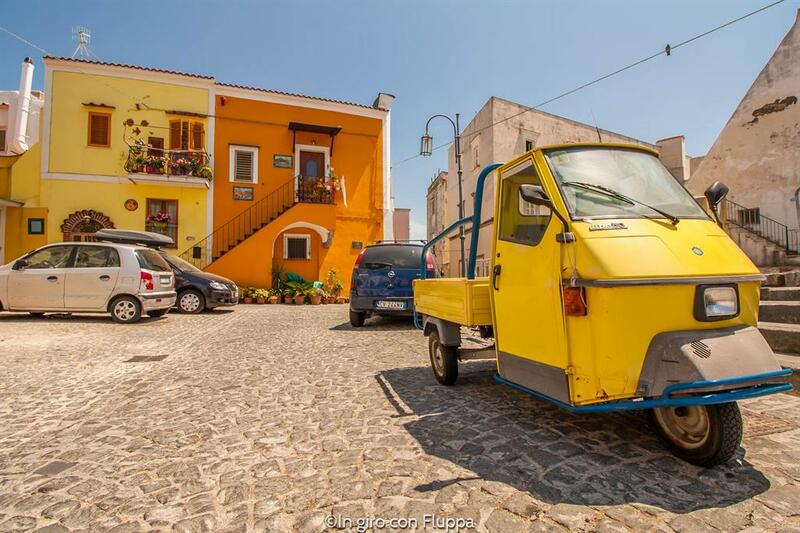 How to get around Procida? 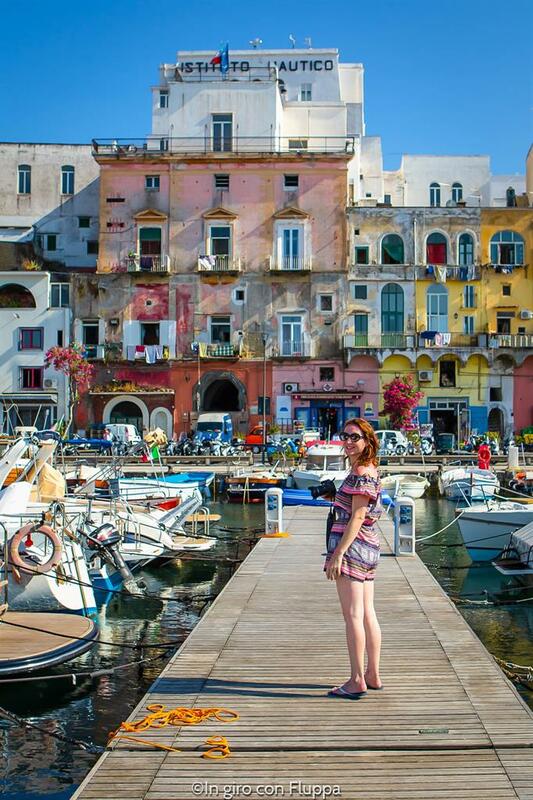 As mentioned before, Procida is a small island and it can be easily visited by scooter, electric bike, or bus. 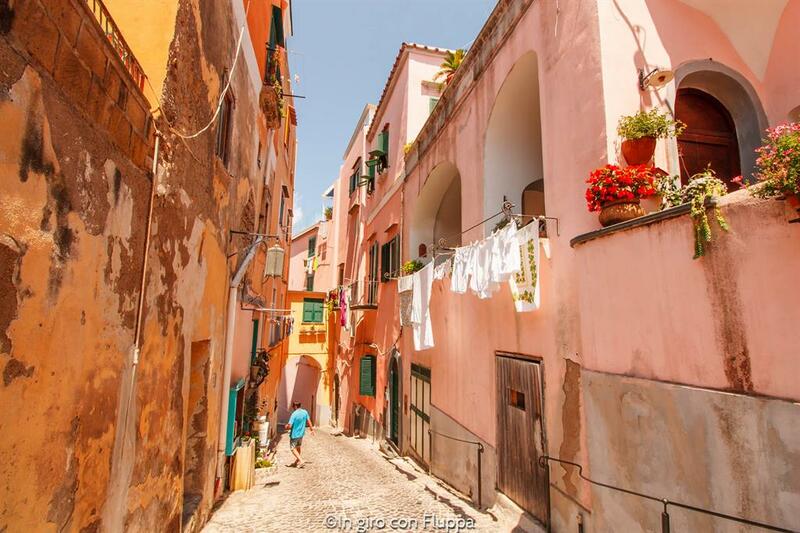 Some areas are easily walkable. 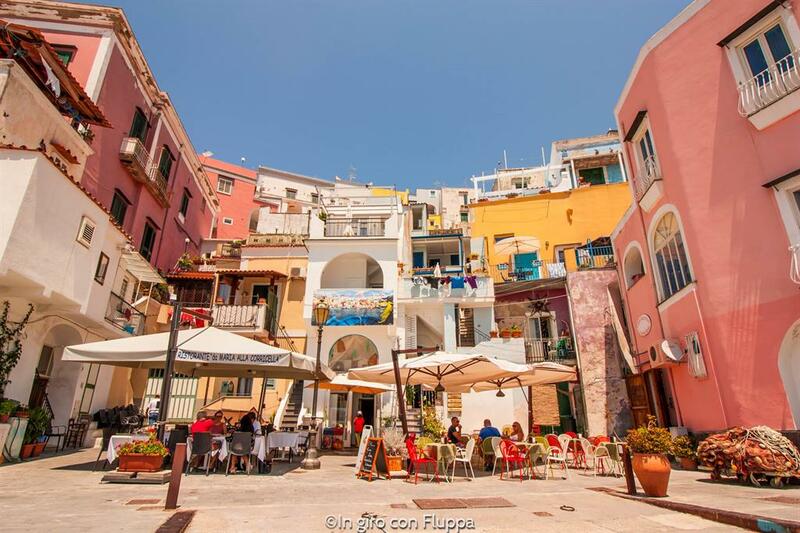 As soon as you land in Marina Grande, you will find the EAV bus station on the right which offers 4 different routes (find all the details of the lines on vivereprocida.it bus service): a single ride costs € 1.50, you can buy the ticket either at the newsstand or at the Caremar box office which is on the right hand side of the harbour. 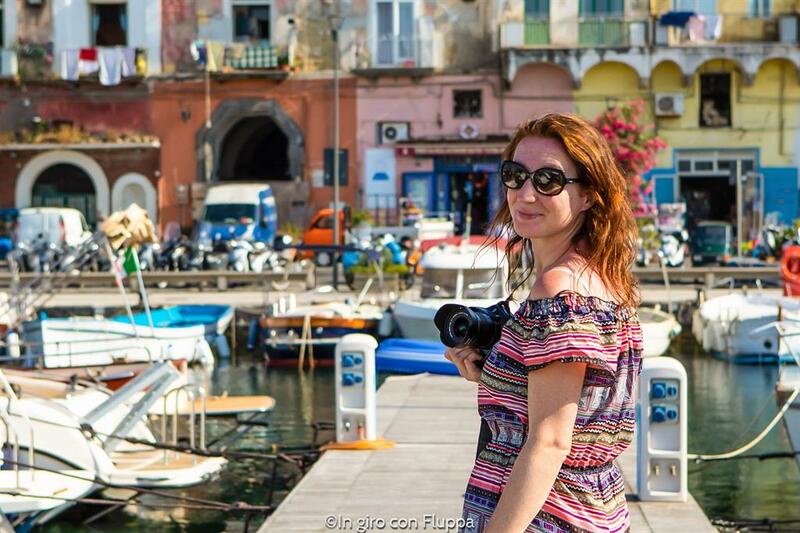 What not to miss on a day trip to Procida? 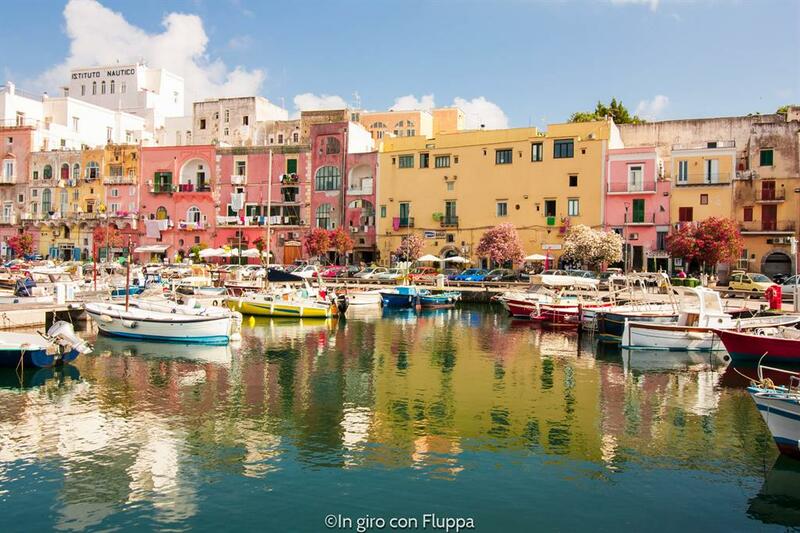 The area around Procida harbour is called Marina Grande. It's the first view you'll have landing on the island and the last one when you leave, it serves as a beautiful calling card for this tiny piece of land! 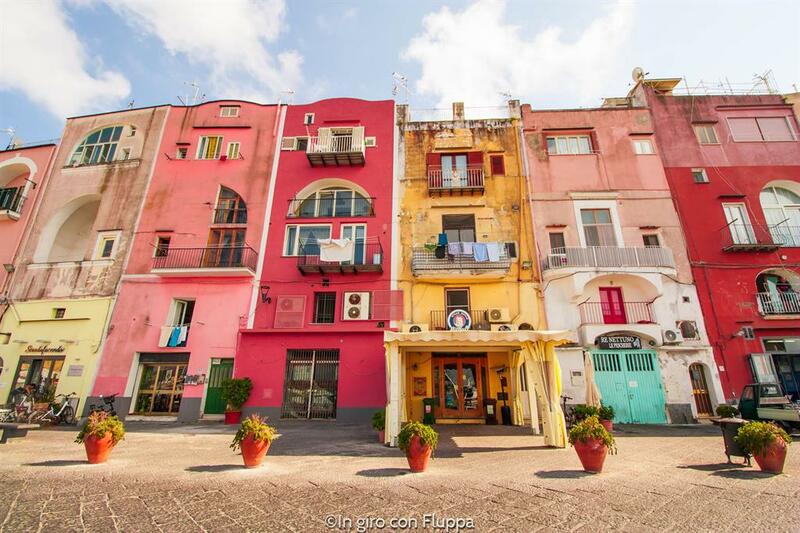 It proudly displays its colorful buildings and its peeling paint, arches and balconies with windows left ajar, the boats lying quietly on the shore. 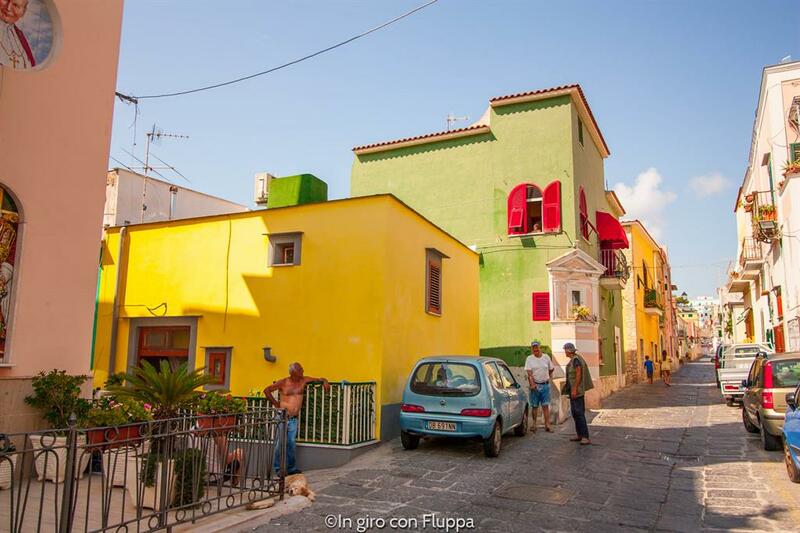 Walking along Via Roma, with the sea to your left, you will get to a square with Santa Maria della Pieta' church on the left and Via Vittorio Emanuele street on the right: this uphill road has a sign "historic center" and "recommended pedestrian path ". 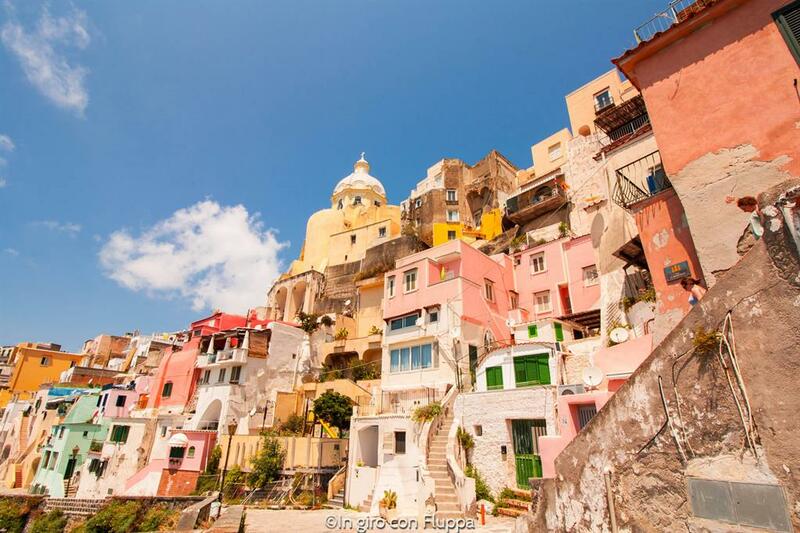 Trust me, take this little climb and you will get to the most beautiful spot on the island! 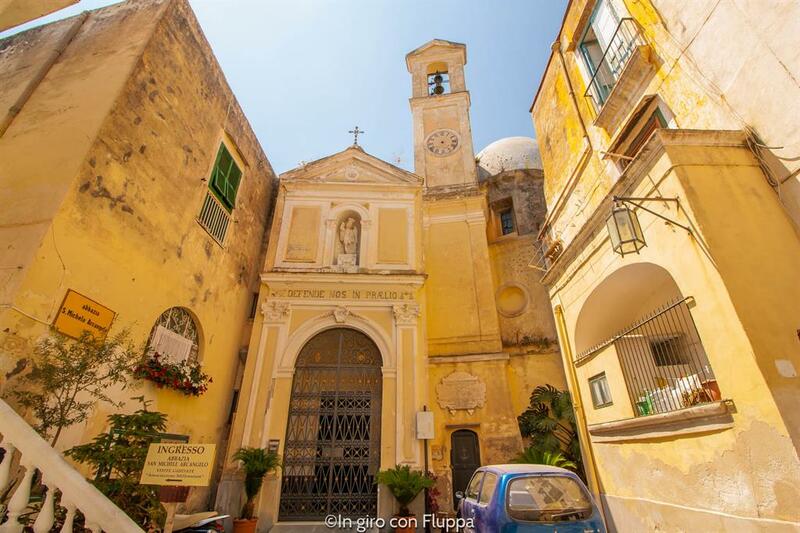 Once you get to San Leonardo church, take the street on your left, via Principe Umberto. 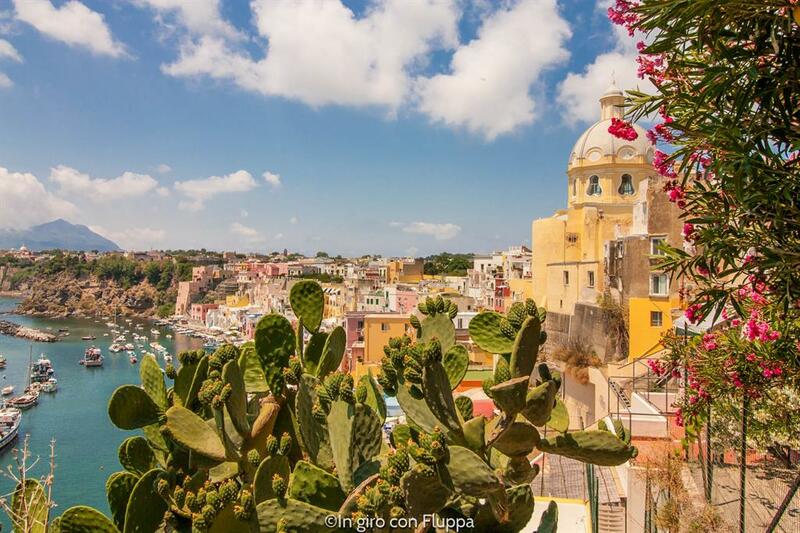 Keep going up until you are in a small square with a beautiful sea view: you're now in Semmarezio, the so-called "Procida's terrace". This area is bounded by four hamlets, multi-storey houses gathered together around a large courtyard, which was the first settlement built outside the area of Terra Murata in the 16th century. 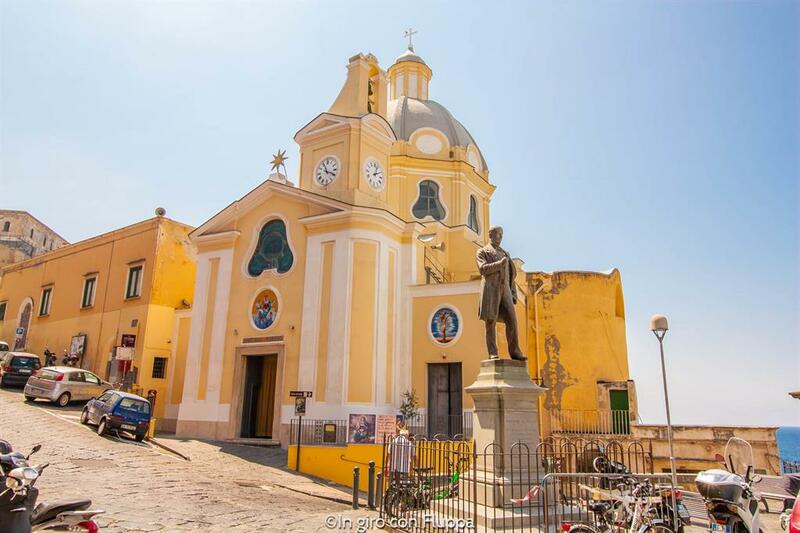 Breathe in the sea scent, look at Antonio Scialoja's statue and the baroque architecture of Santa Maria delle Grazie Sanctuary, then continue to climb along the same road: you will have pastel-colored buildings and clothes hanging to dry on the left, the never ending blue of the sky and the sea on the right 😍. These two cannons date back to 1799, they belonged to one of Horatio Nelson's English ships during the Neapolitan Republic collapse. You'll have now reached Terra Murata, a village built on the highest point of the island (about 90 meters above sea level); narrow and isolated streets, orchards and vineyards, the sea breeze, the scent of flowers and typical houses mark out this village that was the only inhabited area of the whole island during the Middle Ages. 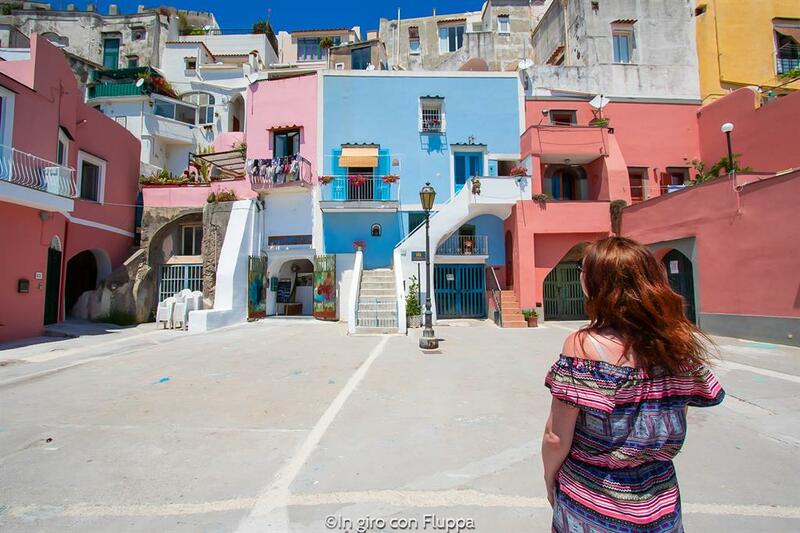 The word "Corricella" comes from the Greek "chora kals", which means beautiful village. 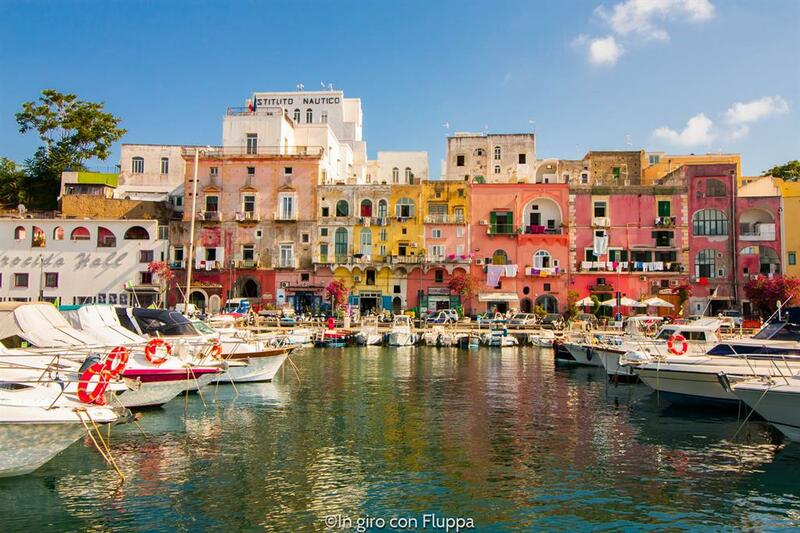 It's shaped as a half moon and is the oldest fishing village in Procida. 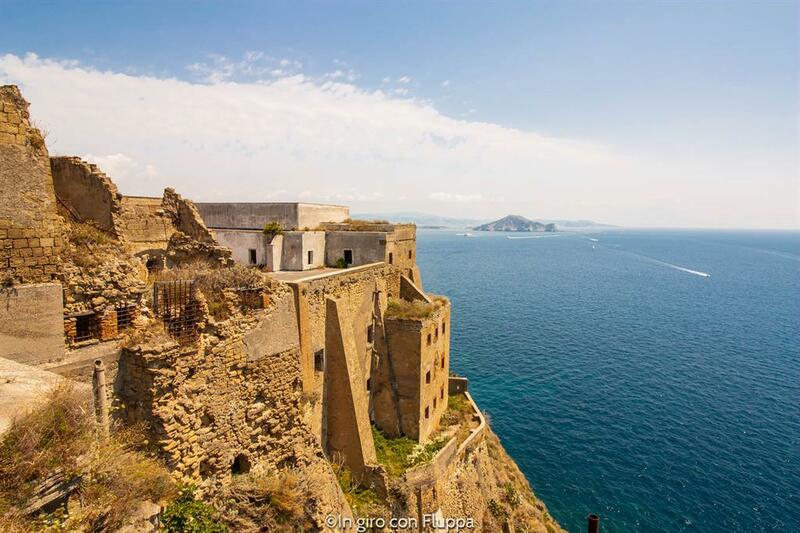 Italians will also recognize the area as the set of the famous, last masterpiece of Massimo Troisi, "Il Postino". 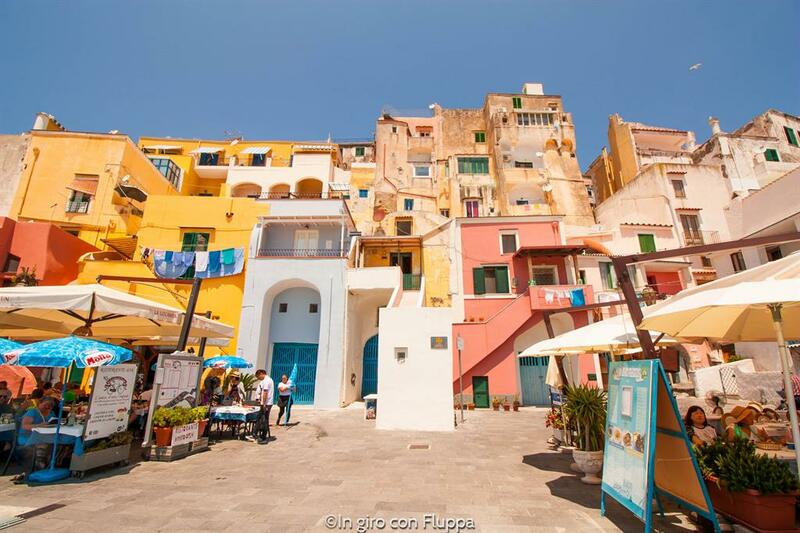 Once you get down you'll be caught by the silence and quiet of the marina, the characteristic architecture made up of arches, windows, domes and stairways with bright colors. 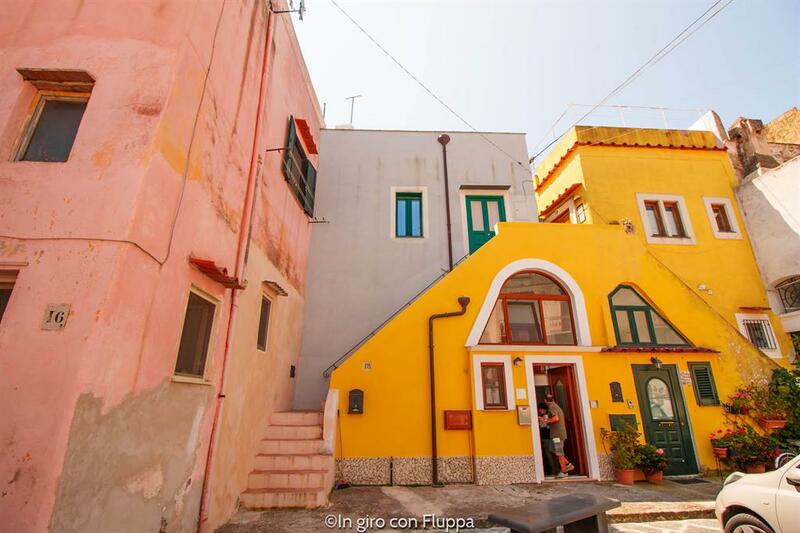 What I love the most, apart from the colors of the houses, is that Corricella is inaccessible to cars and motorcycles: the only way to reach it is by sea or by land, by one of the four stairways. That's one of the reasons why the village is so quiet and peaceful, where really the only noise you'll hear will be the one from the restaurants' cutlery. Going back to the harbour, we took the bus L1 to visit the last village of our short visit. 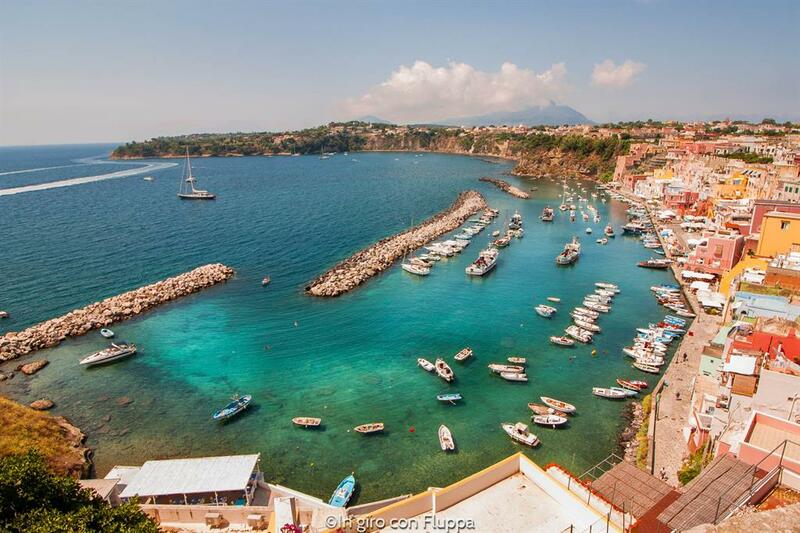 Chiaiolella means small beach and is the most popular area in summer thanks to its seafront full of clubs, hotels and restaurants. 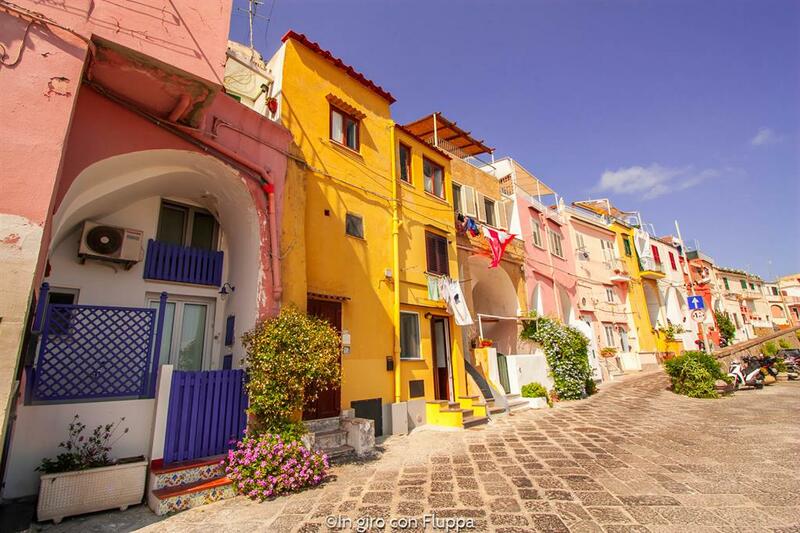 Luckily this village has managed to maintain its authenticity, despite being a popular destination, with colorful old houses and the characteristic small harbor formed by an ancient volcanic crater. 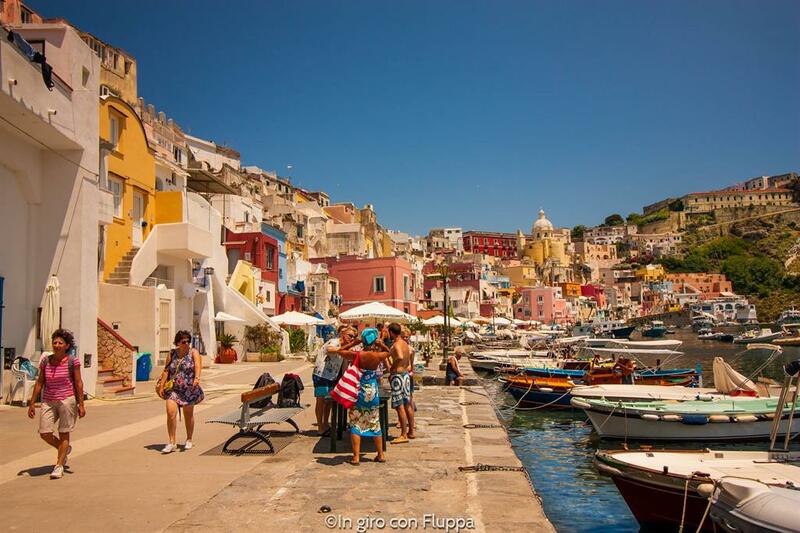 We sat for a while on the a wall chatting, watching the boats on the harbor and enjoying the cool breeze, then we took the bus back to Marina Grande where the ferry was waiting for us. 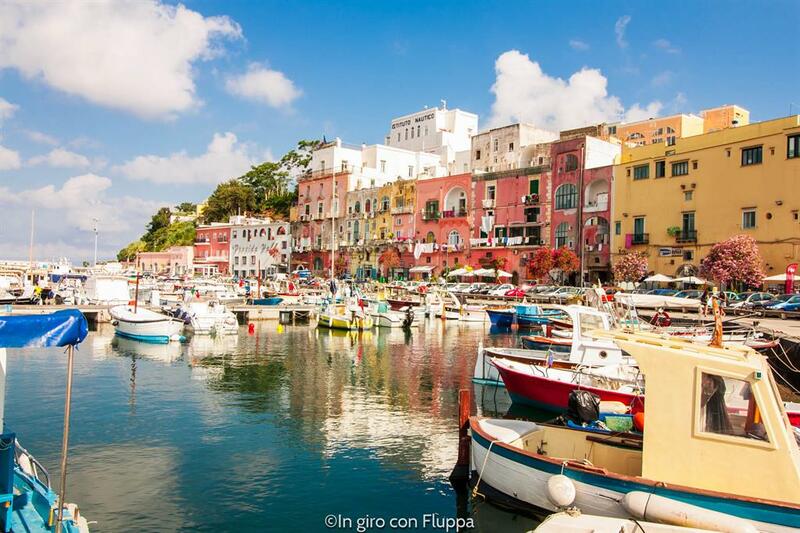 Procida is a great idea for a one day trip from Naples. 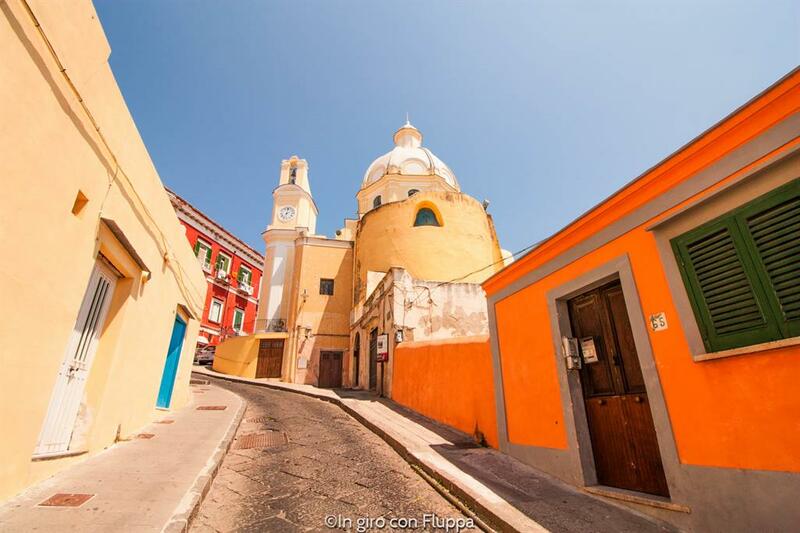 Small, romantic, colorful and cheerful, perfect to visit in just one day. 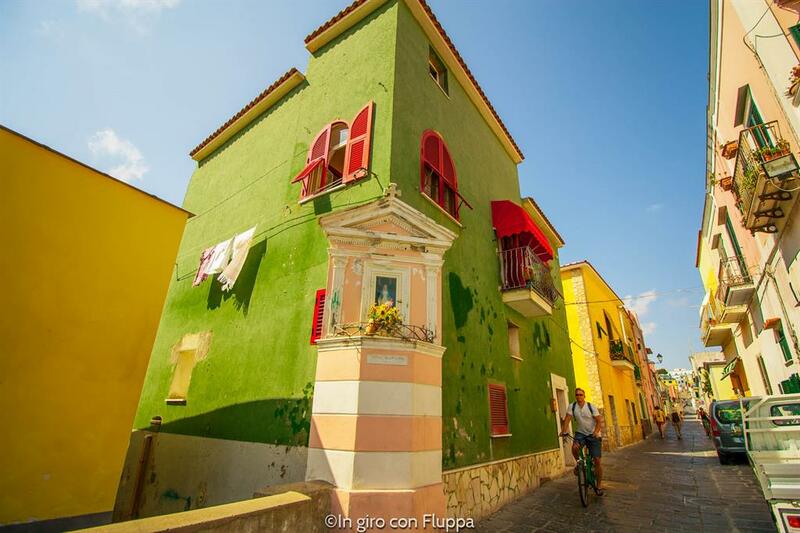 And I love it because it reflects my vision of the world: simple and genuine, warm and sweet, cheerful and brightly colored.